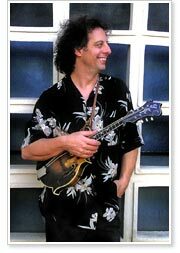 Cazadero, Calif. — California Brazil Camp (CBC) 2008 is proud to announce that Mike Marshall has joined their staff as mandolin (bandolim) instructor for the week of August 17-23, 2008. Held in Cazadero, California, about two hours north of San Francisco, the camp features programs in strings, percussion, piano, wind instruments and dance, all presented by some of the finest Brazilian performers to be found anywhere. A second week of instruction occurs August 24-30. CBC is located along Austin Creek in a beautiful redwood grove, and has numerous hiking trails and many wonderful natural sites to enjoy. In addition to daily instruction programs, student/teacher jam sessions in choro, pagode, Samba-jazz and free style are held each evening. The camp also features an espresso bar, two Brazilian movie nights and a Brazilian Churrasco (barbeque) is held on the final day of camp. Click map pin for directions to California Brazil Camp 2008, Cazadero, California.